President Akio Toyoda wants the recall crisis behind him, Toyota execs say. He didn't raise the topic at Toyota's earnings presentation in Tokyo. The opening slide of Toyota's earnings presentation last week in Japan said it all: "Ready for a fresh start." The optimism seemed less about Toyota's rebound to a full-year profit than the company's eagerness to put to rest its unprecedented global recall problems. 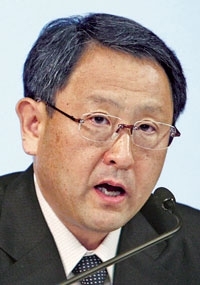 President Akio Toyoda and other executives didn't mention "recall" or "quality" once in their speeches, blithely ignoring the 5-ton elephant in the room. Privately, Toyota officials say their boss wants to put the matter behind him with the close of the fiscal year that was just reported. Toyota not only zoomed back to profit after its first loss in seven decades; it predicted earnings will surge this year despite the recalls. But the recent past is far from buried. And Toyota still has to watch its back as it moves ahead. U.S. Transportation Secretary Ray LaHood is combing through 500,000 internal Toyota documents to gauge whether the company acted promptly and candidly enough in dealing with its safety problems. And that will take months, he says.